This offseason, MiLB.com is honoring the players -- regardless of age or prospect status -- who had the best seasons in their organization. We're taking a look at each team to determine the outstanding seasons in Minor League baseball. Select a team from the dropdown below. Competing in the American League East against high-spending clubs like the Yankees and Red Sox, the Rays have found success by cultivating talent from within. Evan Longoria, David Price, James Shields and B.J. Upton are all homegrown players who have helped Tampa Bay reach the playoffs three times in the past four years and win a pair of division titles. This past season, the club utilized a new wave of talent from its Minor League system. Outfielder Desmond Jennings was a key player during the Rays' stretch run, while left-hander Matt Moore started Game 1 of the AL Division Series. The organization's Minor League teams also thrived, with Triple-A Durham and Class A Bowling Green posting a combined 157-122 record en route to playoff berths. Here are some of the players who most contributed to the Rays' success down on the farm. Catcher -- Stephen Vogt, Montgomery (97 games), Durham (31 games): A 2007 12th-round pick, Vogt not only was the best offensive catcher in the system but one of the best offensive players overall. The 27-year-old led the organization with 105 RBIs -- 19 more than anyone else -- while hitting .298 (sixth) with 17 homers (third). While dividing time at catcher, the outfield and DH, he amassed a system-leading 252 total bases en route to being named a Southern League midseason and postseason All-Star. "He did an outstanding job offensively in Double-A and then that carried over into Triple-A," said Mitch Lukevics, the Rays' director of Minor League operations. "It's tough to see the forecast and the future, but he's going to come into Spring Training on the 40-man roster for the first time. He's been there in the past, but I think when you're on the 40-man, that's a whole different ballgame." First baseman -- Dan Johnson, Durham (93 games), Tampa Bay (31 games): Johnson has had three healthy years in the Rays system, playing more Minor League games than Major League ones in each of them. He followed up on his International League MVP campaign in 2010 by hitting .273 with 13 homers, 52 RBIs and an .842 OPS this season. He batted just .119 in the bigs, but he came through with a pretty important home run for the Rays. Second baseman -- Tyler Bortnick, Charlotte (132 games): Bortnick provided everything one would want from a top-of-the-order hitter, displaying both patience and speed for the Stone Crabs. The 24-year-old posted a .423 on-base percentage and stole a system-leading 43 bases while getting caught only four times. Although he hit only four homers, he smacked 34 doubles and seven triples en route to 205 total bases. He also batted .306 to rank fourth in the organization. "Tyler's the grind-it-out type of player," Lukevics said. "He's a hustle player that can beat you in many different ways -- get on base, steal bases, very aggressive. A high-energy type of player. We're really pleased from Tyler and how he did in the Florida State League." Third baseman -- Russ Canzler, Durham (131 games), Tampa Bay (three games): After posting a .938 OPS at Double-A in 2010, Canzler put together another impressive offensive year, compiling a .930 OPS. He was among the Rays' leaders in a number of offensive categories, including average (.314, second), homers (18, second), RBIs (83, fourth) and total bases (251, second). He was named International League MVP and earned a spot on the midseason and postseason All-Star teams. "Russ showed everybody that he can swing the bat," Lukevics said. "He hit for average and he also hit for power. When the game was on the line, he has the ability to drive in runs. That's a really good year when you're not only a league MVP but the International League MVP." Shortstop -- Hak-Ju Lee, Charlotte (97 games), Montgomery (24 games): Acquired from the Cubs in the Matt Garza trade, Lee batted .292 with five homers, 17 doubles, 15 triples and 30 RBIs in 121 games. Hitting at the top of the order, he led the organization with 98 runs scored and checked in second with 33 steals. He earned spots on the Florida State League midseason and postseason All-Star teams and also participated in the All-Star Futures Game for the second straight year. "He did everything you would want to see from a shortstop and more," Lukevics said. "Defensively, he has plus tools. Offensively, he knows how to get on base and has great speed to steal bases. When he went to Double-A, it was a whole different challenge for Hak. I think some of the deficiencies in Double-A, by physically maturing and gaining some strength, he will take care of that." Brandon Guyer, Durham (107 games), Tampa Bay (15 games): Another player who came over in the Garza trade, Guyer's .312 average for the Bulls placed him third among Rays Minor Leaguers. He was a solid all-around player at Triple-A, collecting 14 homers, 61 RBIs, 78 runs scored and 16 steals. And his .905 OPS led all players in the organization who played at least 70 games. "He's a great athlete," Lukevics said. "He has the ability to hit, he's an excellent defender and he can really run the bases. He offers a lot of things in both halves of the innings." Desmond Jennings, Durham (89 games), Tampa Bay (63 games): Though he spent such a large part of the year in the Majors, Jennings' Minor League numbers still placed him firmly among the Rays' top outfielders on the farm. His 12 homers quadrupled the total from the previous season, when he was dealing with a sore shoulder. The 25-year-old also hit .275 and swiped 17 bases before batting .259 with 10 dingers and 20 steals in the bigs. Between the Majors and Minors, he totaled 64 RBIs and 112 runs scored. "He was healthy for the entire year for the first time since his Columbus year, when he played in Low-A," Lukevics noted. "He's been nicked up, banged up, and that's kind of derailed him somewhat. What he showed last year was the type of player we all thought he would be, the type of athlete he is, and that he has the ability make an enormous contribution." Kyeong Kang, Montgomery (99 games): Selected in the 15th round of the 2006 Draft, Kang was a lighter version of the other two outfielders on this list -- though he did not excel at any one aspect of the game, he was generally solid in a number of areas. The 23-year-old smacked 11 homers, 14 doubles and four triples while stealing six bases. He got on base at a strong .384 clip, helping him to an .821 OPS. "He came out this year not in a starting role and he earned his way into a starting role and performed very well for us in 2011," Lukevics said. "Look at the on-base percentage, the ability to take a walk, to drive a baseball. He had a very good year, and in his first Double-A season." 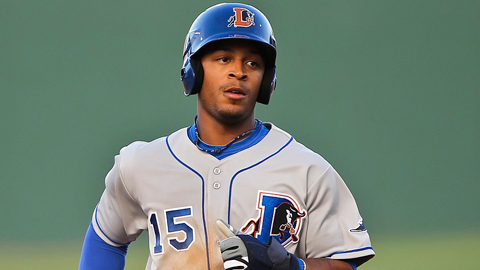 Utility -- Tim Beckham, Montgomery (107 games), Durham (24 games): The No. 1 overall pick in 2008, Beckham regained some of his prospect status by hitting .271 with 12 homers and 17 steals in 22 tries. Though his average dropped from .275 to .255 after his promotion, his power improved drastically -- he hit five homers at Triple-A, compared to seven in more than four times as many games at Double-A. Overall, he scored 94 runs (third in system), drove in 70 runs (ninth) and compiled 214 total bases (sixth). He joined Lee in representing the Rays at the All-Star Futures Game. "I think you see a young high school kid who has matured, both physically and mentally," Lukevics said. "I think with that, you saw a more consistent baseball player. He shored up his weaknesses on defense, showed the ability to drive the ball, and we expect bigger and better things in his future. He was in Triple-A last year at 21, when a lot of 21-year-olds come into the Draft. And he was competing at a high level in Triple-A." Right-handed starting pitcher -- Alexander Colome, Charlotte (19 games), Montgomery (nine games): Colome, the nephew of former Rays reliever Jesus Colome, was solid if unspectacular in his second full professional season. The 22-year-old posted a 3.82 ERA with 123 strikeouts in 157 2/3 innings, racking up 12 wins to rank second in the system. He had some trouble with walks, issuing 72, but was able to counteract that wildness by allowing opponents to hit just .216. "He has plus stuff; there's no question about Alexander's stuff," Lukevics said. "Now he's at the point where you take that good stuff and refine the delivery so he's able to throw quality strikes. And when he does that -- and we're confident that he can do that -- he's going to be a really good big league pitcher." Left-handed starting pitcher -- Matt Moore, Montgomery (18 games), Durham (nine games), Tampa Bay (three games): The Rays had other strong southpaws in Alex Torres and C.J. Riefenhauser, but Moore was far and away the best pitcher in the Minor Leagues. He ranked second in the Minors with a 1.90 ERA and 210 strikeouts, combining for 155 innings between Double-A and Triple-A. The highlight of his season might have been his nine-inning, 11-strikeout no-hitter against Mobile on June 17 or it might have been the seven shutout innings he threw against the Rangers in Game 1 of the ALDS that gave the Rays their only playoff win. In October, he was given the J.G. Taylor Spink Award as the Topps Minor League Player of the Year. "He's a kid that pitched two years in the [Rookie-level] Appalachian League with our Princeton affiliate," Lukevics said. "With a great work ethic and great attitude, with some help from his coaches, the world saw his ability in the first game of the [ALDS] against the Rangers. What more can you say? The future is bright." Relief pitcher -- Chris Rearick, Bowling Green (50 games): The 24-year-old right-hander shared the organization lead with 20 saves while tallying seven wins out of the Hot Rods' bullpen. He put together a strong strikeout rate while limiting his wildness, fanning 89 and walking 16 batters over 81 1/3 innings. Rearick's 1.66 ERA was the best of any Rays reliever who appeared in at least 20 games, and his efforts earned him a spot of the Midwest League postseason All-Star team. "He showed us a plus fastball at times and a plus breaking ball," Lukevics said. "He learned a lot about himself, a lot about his delivery. We saw him more consistent in the strike zone. Throwing it within the strike zone, more times than not you get good results. I'm happy for him and what he did for us this past year."